Valkerase® is a unique keratinase processing enzyme processing additive that creates better quality, lower cost feather meal naturally. Discovered by Dr. Jason Shih, co-founder of BRI, Valkerase hydrolyzes keratin peptide bonds in feather waste, resulting in feather meal that is more easily digested by animals. 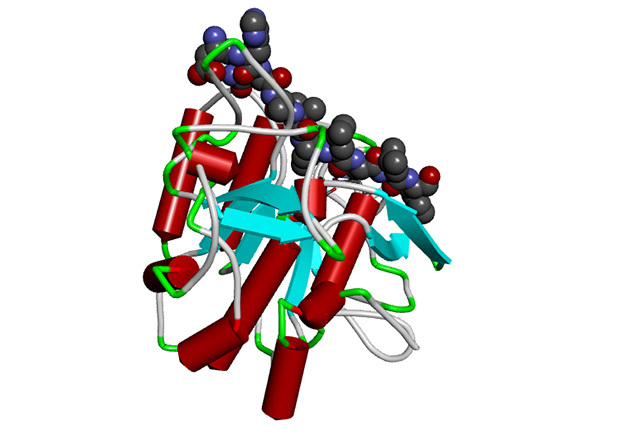 3D structure of Valkerase enzyme depicted in ribbon form with a short peptide molecule bound in the enzymes active site. Natural Nutrients Co., an animal feed additive distributor in Southeast Asia, discovered the power of BRI’s innovative enzyme technology when they began using Valkerase. Other than feathers, what proteins can be improved by using Valkerase? Valkerase was originally developed by BRI to improve the digestibility of poultry feathers, but anecdotal evidence suggests that it is possible to use Valkerase to improve the digestibility of other protein sources such as fish meal and meat and bone meals. What is the application, inclusion rate, and stability of Valkerase? Valkerase is a dry powder that is added at a rate of 1.5 kg per metric ton (or 3.3 lb per U.S. ton) of raw feathers before cooking. Dry Valkerase powder is stable at room temperature and dry storage up to 50° C.
Where can I get a sample of Valkerase? What is the recommended batch process procedure for making Valkerase-treated feather meal?